How often have you had the experience where you carved some time out of your busy life to take a vacation or go camping or visit a retreat and while you were gone you had some amazing experiences, for example a glorious sunrise (if you're a morning person) or sunset (if you're like me and think mornings are the bane of human existence)? Vacations and big breaks are great, but I propose taking a five minute vacation any day with a Sunset Mindfulness Practice. You can have a moment of peace, appreciation, mindfulness, and gratitude in your every day life. On our last vacation, Mr. Awesome and I made a sunset dinner reservation at a restaurant on an island. As the sun cascaded it's golden rays over the ocean we marveled at its beauty. We were so happy to be sharing an extraordinary meal watching an extraordinary sunset, but we didn't want the moment to end. Then we realized, there is beauty in every day if you take the time to see it. We vowed to find that beauty and commit to watching a sunset together at least once a week. This commitment has been amazing. You've probably seen at least one article that talks about the importance of mindfulness, meditation, and gratitude. These practices increase happiness and help create a loved, lived life. 1) If you need to, set a reminder on your phone near sunset to break you out of your routine to go appreciate the sunset. 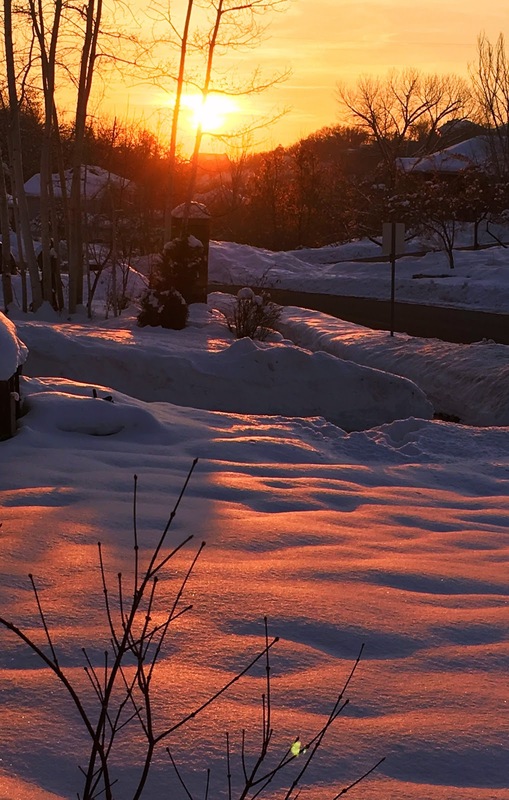 (Many of the weather apps will tell you what time sunset is that day.) Mr. Awesome and I are often making dinner around sunset time, especially in the winter, and will step onto our porch for this mini vacation. 2) Once you've made it to where you can see the sunset, be still and come into the present moment. What does come into the present moment mean? Take in all that is around you at this moment: What you see; What you hear; What you feel (i.e. the feel of the air or your clothing against your skin or maybe your partners hand in yours); Breathe. Pick the point where you best feel your breath, maybe your nostrils, your stomach rising and falling, or your chest expanding and contracting, and focus on the sensation there. 3) Quiet your mind. If thoughts crop up, don't chide yourself, but accept them and return to the present moment by focusing on your breath and the panorama before you. 4) Don't talk or otherwise distract yourself, focus on this natural phenomenon unfolding before you. Be here now. 5) After the sunset has faded, or your mindfulness timer has chimed, or you feel you've been there long enough, return to your regularly scheduled programming refreshed and grounded. 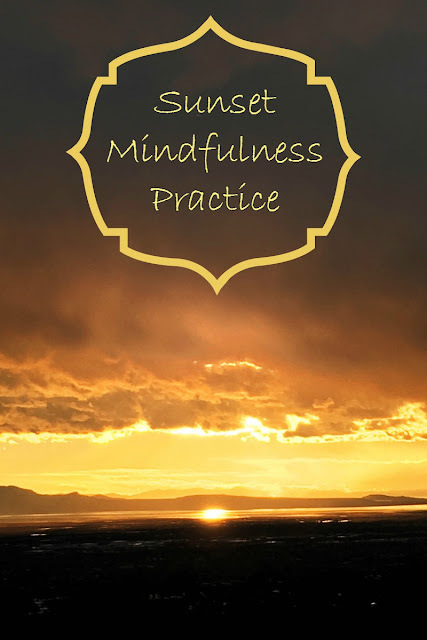 You don't have to be anywhere special to practice the sunset mindfulness practice. This shot was taken before practice standing in a parking lot. the changing seasons as well.